Are you ready to play in StarCraft 2 in a competition and win cash? No? 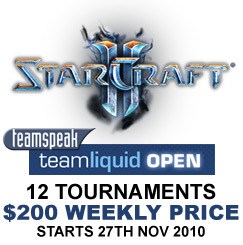 Then its a good moment now to get prepared because TeamSpeak does sponsor the "TeamSpeak TeamLiquid StarCraft 2 Open Series", a 12-tournament event spanning 3 months. Each tournament will have a $200 prize pool and will alternate between European and North American servers. Sign up with TeamLiquid and get ready for it. The first tournament is scheduled to launch on November 27th on European servers, with registration opening on November 23th. TeamSpeak will also provide a dedicated Voice server for all TeamLiquid users to chat while watching events or playing StarCraft 2. TeamSpeak Systems says "This is the first long-term sponsorship for any TeamLiquid Open and we are thrilled to be a part of it. So if you're a StarCraft 2 fan be sure to check it out! ... We want to extend a special thanks to TeamLiquid for offering this opportunity to us, and an advance thanks to any TeamSpeak/TeamLiquid participants. Best of luck!". Check out the TeamLiquid's official news article for further details. TeamLiquid is a news and community website centered around Blizzard's StarCraft: Brood War and StarCraft 2. Here you'll find everything you need to know about the professional StarCraft scene, including pro-gaming news and information, videos, strategies, and replays. Powered by over 100 staff members from all over the world, they maintain a StarCraft Wiki called Liquipedia, a database of every professional StarCraft game ever played in the TLPD, and an extremely active forum where thousands of users interact every minute of the day.